• Structure ID: NBI: 5380. • Location: River Mile 293.7. • River Elevation: 931 Feet. • Daily Traffic Count: 610 (2004). 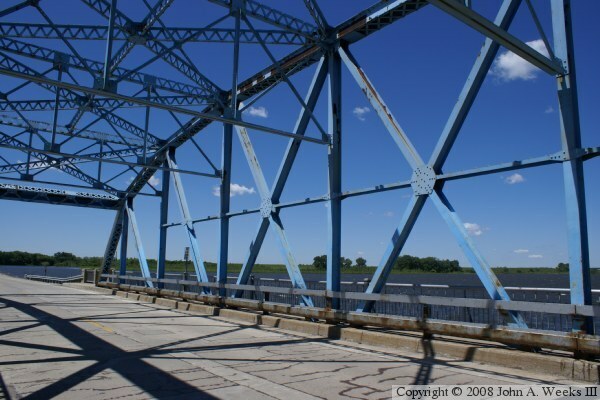 • Bridge Type: Steel Through Truss. • Length: 220 Feet, 162 Foot Longest Span. • Width: 27 Feet, 2 Lanes. • Height Above Water: 17 Feet. 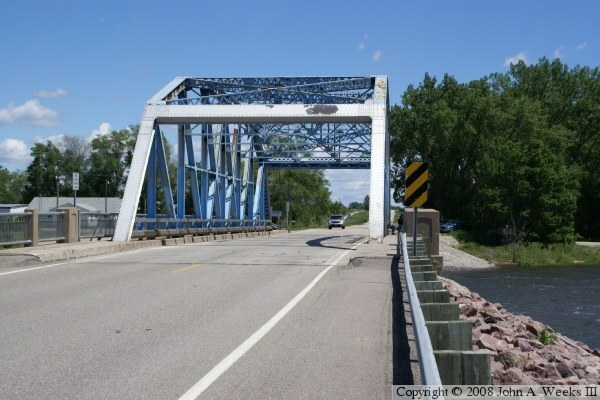 The MN-40 highway bridge at Milan is one of the few remaining through truss bridges left in the state of Minnesota on a state or federal highway. 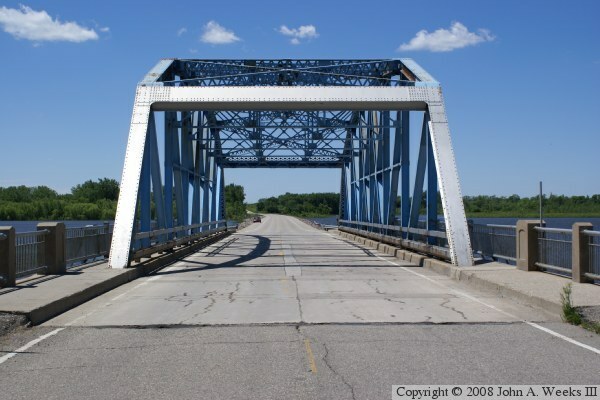 A through truss is the style where the highway runs through the truss structure, and not above or below the truss. 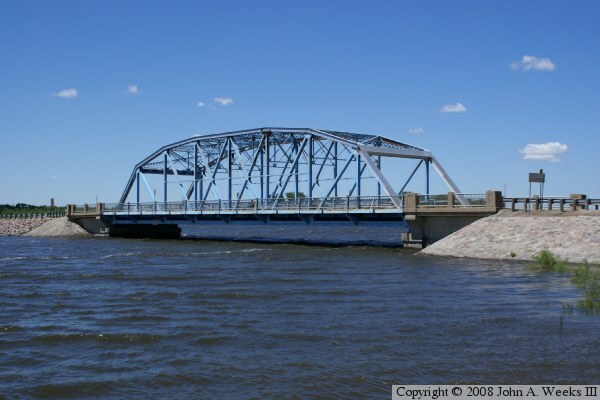 This bridge was built in 1938, replacing an earlier bridge that would be flooded out due to the completion of the Lac Qui Parle Dam some 7 miles downstream. The bridge sits near the northeast end of a causeway. There is about 200 feet of causeway northeast of the bridge, and about 1400 feet of causeway southwest of the structure. The metal bridge structure is 162 feet long, but the overall bridge is 220 feet long when you include the concrete abutments. The bridge can accommodate loads as tall as 16 feet, and during periods of normal water levels, the deck sits 17 feet above the water level on the tall end of the structure. The concrete pillars have some interesting Art Deco era details, while the bridge railings have a classical wrought iron look. The Milan Bridge is a popular fishing location. There is a day use area on the downstream side of the bridge complete with a fishing pier. One may also fish from the bridge sidewalk or from the causeway. 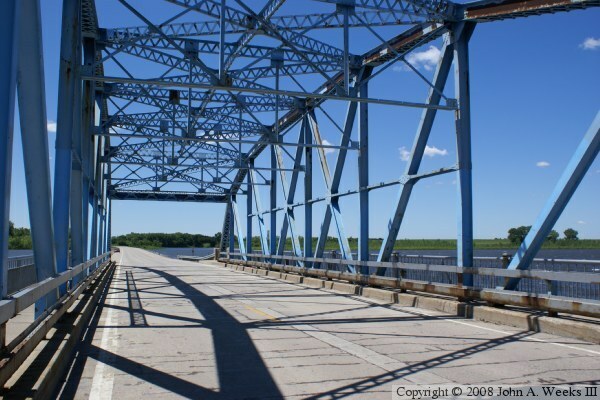 The photo above is a view looking west towards the bridge truss span as seen from the day use area on the downstream side of the causeway. 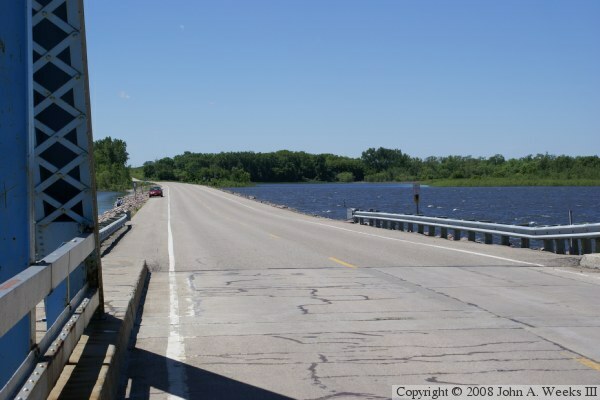 The photo below is looking southwest down the length of the bridge deck from the center of highway MN-40. The photo above is looking towards the northeast bridge portal from the downstream side of the river crossing. The photo below is a view looking down the length of the causeway beyond the southwest end of the bridge. These two photos are looking to the southwest from inside the truss structure. 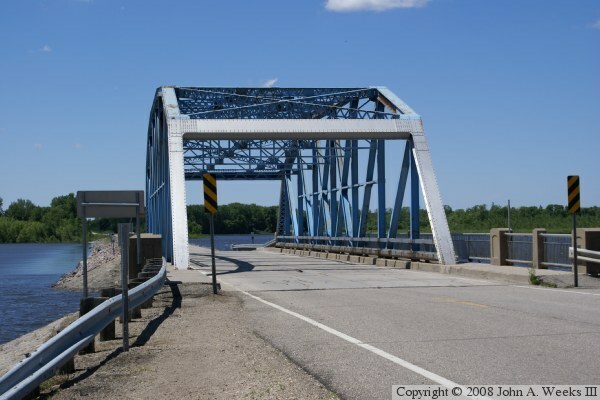 The photo above is looking towards the portal on the far end of the bridge, while the photo below is looking across the bridge deck towards the upstream side of the river crossing. The photo above is looking northeast towards the southwest bridge portal as seen from the northbound traffic lane. 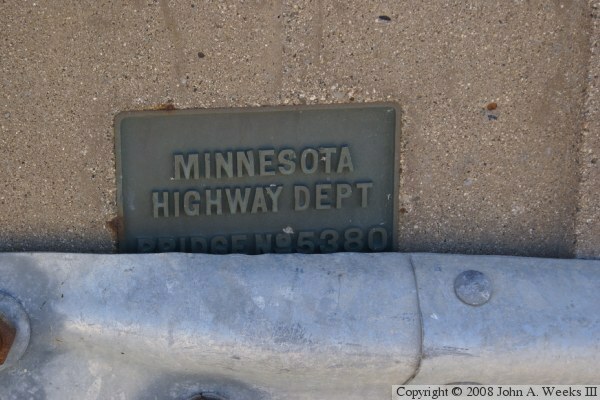 The photo below is the bridge plate, which is partially hidden by a metal guardrail.